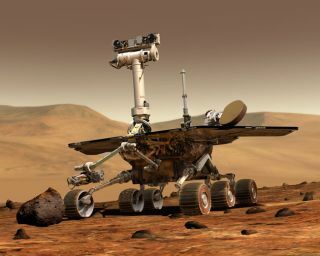 NASA's twin Mars rovers, Spirit and Opportunity, have now spent 10 years on the surface of Mars. With spring on Mars in full swing, NASA is taking advantage of the Martian season's ever-longer periods of daylight to try again to reawaken its stuck rover, Spirit, after months of silence. The Mars Spirit rover has been dormant since March 22, 2010. Mission controllers at the Jet Propulsion Laboratory in Pasadena, Calif., are hopeful that the plucky rover survived the harsh Martian winter and will wake up any day now. NASA's Mars rover team had anticipated that Spirit would enter a hibernation-like low power mode during the planet's long winter season, with minimal activity except for charging and heating its batteries and keeping its internal clock running. With most heaters shut off, Spirit's internal temperatures dropped to the coldest ever experienced by the rover on Mars. That stress may have caused damage, such as impaired electrical connections, that would prevent reawakening or, if Spirit returned to operation, reduce its capabilities. After mid-March, when the days on Mars once again grow shorter, the prospects for reviving Spirit will begin to drop, NASA officials said. Communication strategies will shift, based on the reasoning that Spirit's continued silence is probably due to factors beyond low power. NASA officials say they will consider it a real possibility that damage from the winter's cold ended Spirit's mission. Spirit landed on Mars Jan. 4, 2004, to look for evidence of past water activity. The mission was originally designed to last for three months, but Spirit put in nearly six years of extended duty. After working far beyond its design life, the rover eventually lost use of its drive motors on two of its six wheels. It has been trapped in Martian sand for over a year, and while NASA rechristened Spirit as a stationary probe, the rover's immobility meant it was unable to obtain a favorable tilt for solar energy during its fourth Martian winter, which began last May. Spirit's twin, Opportunity, remained active and is currently making its way toward a huge crater called Endeavour. Opportunity landed on the Red Planet three weeks after Spirit, and both rovers made important discoveries about wet environments on ancient Mars that perhaps were favorable for supporting microbial life. Spring on southern Mars began in November 2010, but even before that, NASA's Deep Space Network of antennas in California, Spain and Australia were listening for Spirit daily. Meanwhile, the rover team was sending commands to try to elicit a response from the dormant rover. The monitoring will now increase, and additional listening periods will include times when Spirit might mistake a signal from NASA's Mars Reconnaissance Orbiter as a signal from Earth and respond. Commands for a beep from Spirit will be sent at additional times to cover a wider range of times each Martian day when Spirit might awaken. NASA also will listen on a wider range of frequencies to cover added possibilities of temperature effects on the rover's radio systems.